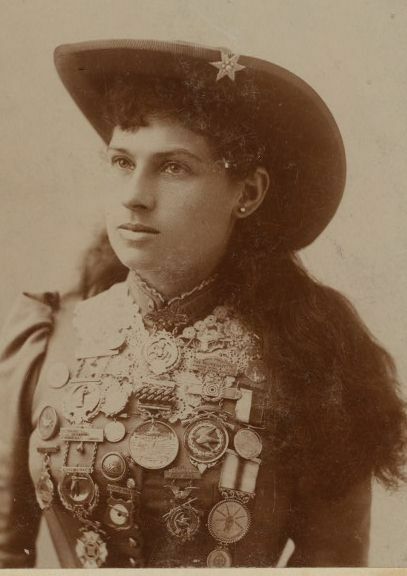 Want to meet the flesh-and-blood Annie Oakley? Summer is the ideal time to visit her hometown of Greenville, Ohio, and her many rural haunts in Darke County. You'll catch a glimpse of who she was and see the verdant farmland and forests that nourished her spirit. You'll also learn who she wasn't, because America's first superstar doesn't resemble the cowgirl of the Fifties TV series or the ditsy heroine of Broadway's Annie Get Your Gun. Born Phoebe Ann Mosey on August 13, 1860, in rural Woodland, Ohio, young Annie honed her skills while hunting to feed her impoverished family. She was a prodigy and a genius whose fame was surpassed only by her indomitable will. There are endless Oakley myths, but it's probable that 15-year-old Annie beat stage marksman, Frank Butler, in a match held on Thanksgiving Day 1875 in a suburb of Cincinnati. By most accounts, Annie married Frank in 1876, but didn't shoot in his act until 1882 -- a period sometimes called Annie's "missing years." When she and Frank joined Buffalo Bill's Wild West in 1885, the seeds of Annie's legend took root, and today she's revered as the greatest marksman our country has ever produced. Paradoxically, the private Annie Oakley Butler was a genteel woman who remained true to her Quaker roots and who reveled in her reputation as "the peerless lady wing-shot," emphasis on lady. In June my husband and I spent a rewarding day visiting Annie Oakley points of interest in and around Greenville. Our first stop was the most impressive: The Garst Museum at 205 North Broadway, home of The National Annie Oakley Center. Among the highlights are an Annie and popular culture display, a personal Annie room, and a professional room. 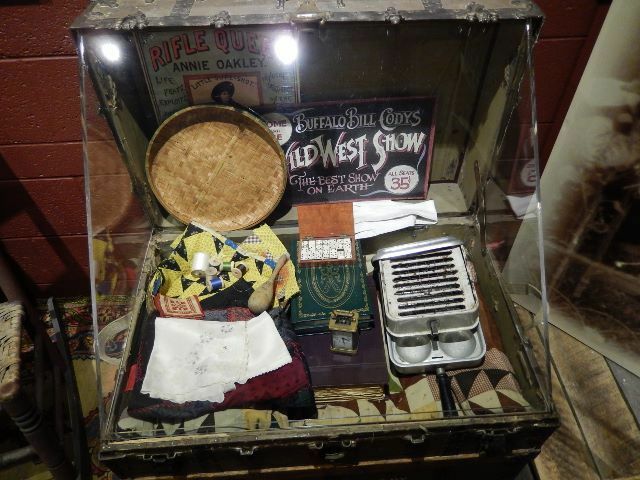 We were delighted to see mementos from Annie's childhood; historic photos from different periods; clothes and jewelry; journal entries in her loose girlish cursive; china and silver; sundry items belonging to her husband-manager, Frank Butler; the rocker and one of the trunks she toted from city to city on Buffalo Bill's Wild West tour; Annie's small copy of the New Testament; and some guns. We watched Thomas Edison's 1894 film of Annie Oakley shooting as Frank tossed clay pigeons -- her speed was remarkable! And as we noticed the smallness of her gloves and boots, we realized how petite Annie was. It also tickled us to see the glass target balls that Annie shot in exhibitions. One of the trunks that Annie Oakley took on tour with Buffalo Bill's Wild West. Our photo was snapped at the Garst. Note Annie's egg poacher (right). Some new artifacts now complement the existing exhibit at the Garst. They include a letter from Annie's husband, Frank Butler, to his brother Will about Annie's final illness, a letter, postcard, and two envelopes in which Frank contradicts a false newspaper story that Annie had died, and a poem about hunting in Florida, with a postscript in Frank Butler's hand. Also on display, given by Donna Roxey for the Roxey family, are two letters from Annie Oakley to James Roxey. These letters are significant because they show that Annie knew she was dying, that she needed blood transfusions, and that she was choosing not to have them. Mr. Roxey was offering to come to Ohio for the transfusions. When I asked Litchfield about future projects, she replied, "Our new goal, besides a small fundraising project, is to record and ultimately transcribe the recollections of Annie's relations. Our Foundation was formed in 2009, and we wish we could have started much earlier." It so happens that Bonnie Perry, Annie's great-grandniece, is the secretary of the AOCF board. The 35,000 square-foot Garst Museum with its 300,000 artifacts also features an exhibit on Greenville's famous native son, Lowell Thomas; a Treaty of Green Ville exhibit; and many other interesting displays. The gift shop sells Annie Oakley books and souvenirs, and the Garst also provides a detailed map of most sites mentioned here. Ask the docent for one when you arrive! After seeing the Garst, we drove down Broadway to the traffic circle, once the intersection of the public square and Main Street. We tried to pinpoint the location of the now-defunct G.A. Katzenberger & Bro., a store that sold "groceries, provisions, notions, guns, and fishing tackle." In the 1870s, Charles Leopold Katzenberger bought Annie's game and became one of her cheerleaders. The Post Office replaced Katzenberger & Bro. on the southeast corner, but the former Masonic Temple is a Victorian-era landmark with its quaint enclosed grey staircase. We continued along Broadway and turned east on Third where we drove for several blocks until we found 227 East Third Street, the former Zemer-Broderick Boarding House where Annie spent her final illness, dying there on November 3, 1926. Today the house is a duplex which faces an imposing former ladies home, the St. Clair Manor, a handsome red brick building erected in 1900. Annie might have enjoyed the view. Several blocks away at 801 East Main and Tecumseh, we found the former Home of Fred and Hazel Grote where Annie's funeral was privately held on November 5, 1926. A gilt angel poses out front, but it's unknown whether this marker dates to Annie's final rites. We paused for a delicious lunch at the Montage Café, 527 South Broadway, a sandwich-and-salad shop with a wide menu. (I recommend the delicious "Tralfast's Twisted Ham" on a Bavarian pretzel and the rice-and-bean salad.) Another hometown lunch favorite is the Maid Rite Sandwich Shop, 125 North Broadway, which is walking distance from the Garst Museum. It's worth noting that Greenville's South Broadway features attractive shops and public buildings, many restored from the turn-of-the-century. The building next to Montage Café at 529 South Broadway, now Youniques, was once the headquarters of H.P. Stocker & Son, Funeral Directors. (Louise Stocker was the only "licensed lady assistant" in town, and she worked closely with Annie Oakley to arrange her burial--Annie's cremation receipt is on display at the Garst.) At the southern tip of the block is the Annie Oakley Plaza whose centerpiece is a towering bronze statue of "Little Sure Shot," as she was dubbed by Chief Sitting Bull when he "adopted" her in 1884. The plaza features an informative marker with biographical details, stone benches, and a wooden gazebo. Heading out U.S. 127 from the center of town, we drove until we entered a rural section of Darke County. After passing York Road, we turned onto Greenville-St. Mary's Road and continued until we saw a brown stone arch at Brock Cemetery. If you travel past the arch, there's a driveway, and if you turn right you'll see a white sign for the Annie Oakley Gravesite. Annie and Frank Butler died eighteen days apart in November 1926, and their two gravestones have the same epitaph: At Rest. It may not be a coincidence that Annie and Frank were buried on Thanksgiving Day, the holiday on which they met 51 years earlier. By all accounts this couple shared a love for the ages. We followed Greenville-St. Mary's Road to North Star-Ft. Laramie Road and turned right to enter Yorkshire. After passing through this peaceful community where Annie's parents are buried in the Mendenhall Cemetery, we turned right onto Spencer Road (which is two miles outside Willowdell) and drove along the desolate lane until we saw a ground-level marker for Annie Oakley's Birthplace. Annie's parents, Susan and Jacob Mosey, built a long-gone log cabin on a tract that was situated 1028 feet due east of Spencer Road in what was then called Woodland, and by some miracle some of the dense forest where Annie may have learned to shoot remains. I got chills standing there, musing on her childhood. 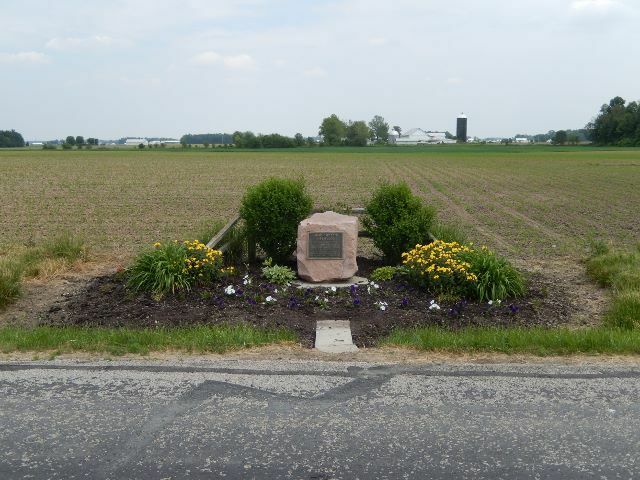 Annie Oakley's birthplace marker on Spencer Road in Darke County, Ohio. We drove up Spencer Road and back through Yorkshire again, continuing on North Star-Ft. Laramie Road until we reached North Star, the village where Annie spent her early teens. We turned south on U.S. 127 and soon saw a white sign saying Annie Oakley Historical Site, and then we found the boulder that stood before Annie's Teenage Home. Annie's mother, Susan Mosey Brumbaugh, married Joseph Shaw after her first two husbands died, and the Shaws built a cabin on this land where Annie became a "market hunter" for the Katzenbergers (circa 1872-1875). The house is gone, but I was enchanted by the landscape and the arrival of chickens who seemed curious about our presence. We noticed an old tree in the distance that might have originally been part of Mrs. Shaw's orchard, though this fact cannot be confirmed. We do know that Annie paid off her mother's mortgage before she left home, and returned to the North Star cabin many times as an adult. As I returned to Greenville that day and thought about the seminal work of the Annie Oakley Center Foundation, I reflected on one of Eileen's Litchfield's comments. "The most rewarding part," she said, "is sharing the life lessons for children that Annie's story teaches. I love watching their reactions when they tour The National Annie Oakley Center at the Garst. They are amazed to learn that this first woman superstar was only five feet tall, that she grew up with poverty and suffered some abuse at the hands of "the wolves" [a foster family], but with her strength of character she succeeded in life. I love to have them read Annie's motto and ask them, 'What does that mean for you?'" "Aim at a high mark and you will hit it. Finally, you will hit the bull's eye of success." Author's note: For help with my research, I want to extend heartfelt thanks to Eileen Litchfield, Chairman of the Annie Oakley Center Foundation; Marilyn Robbins, Board member of the AOCF; Nancy Stump, Board member of the Garst Museum; and Clay Johnson, Director of the Garst Museum. Photos of Annie's travel trunk and Annie's birthplace marker are by Barry J. Eisenberg. The photo of Annie, reproduced from a "Stacy of Brooklyn" cabinet card, is in the public domain.